Harrogate, UK, Saturday 9th March 2019. The spa town of Harrogate in North Yorkshire, England, sits prettily amidst the sort of rolling countryside of which poets and writers are fond. With a population of 75,000, it boasts the Royal Pump Room, the original Betty’s Tea Rooms, two orchestras and, once a year, Airecon – Northern England’s premier analog gaming event. It’s a board game convention that has grown enormously in its 6 years of existence, from the organiser’s front room (AireCon 0) to taking over most of Harrogate’s vast convention centre and attracting 2,000 people over 3 days. I only attended the day of Saturday so can’t report on the convention as a whole but here, in no particular order, are six impressions from the event. Let’s start with the big one: best game actually played. I’m tempted to choose Patchwork, mainly because I actually won for the first time ever. My wife usually leaves me in the dust but I was able to best my friend by a 3 whole points (I’m ignoring the fact that we both finished with a negative score and that he’d never played before). Instead my favourite game was the Mega-NMBR 9 event (sponsored by Z-Man Games). I’d never played NMBR 9 before but it’s a great little game – quick, fun and a satisfyingly moreish puzzle (see the Meeple Mountain review of NMBR 9). There’s something rather magical about a whole room of people simultaneously taking and placing the same numbers at the same time and resulting in completely different patterns, with end scores ranging from between 30 and 99. Curiously, at the table I played at everyone always orientated their starting number in a different direction. It must be something with the human mind and our spatial perception. Turning right after entering the convention and walking past tables of people happily playing games, you found something utterly captivating on the back wall of the main hall: thousands of playing cards, each with a hand drawn picture of a cat. 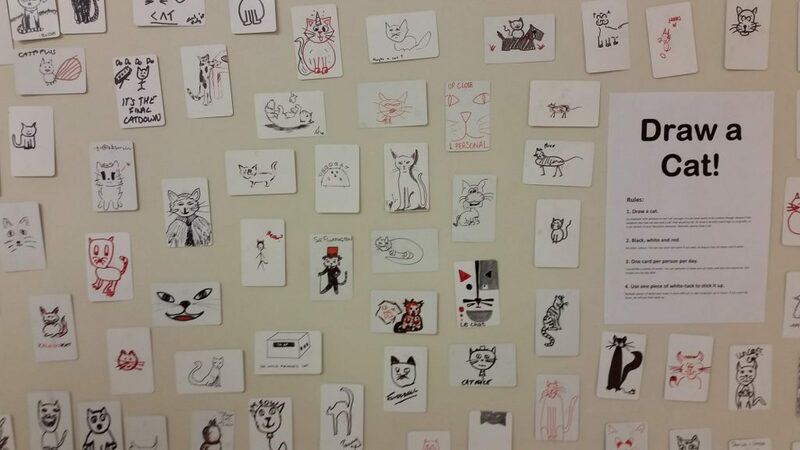 Bez Shahriari’s Cat Gallery was a sight to behold: beautiful, weird, scary and imaginative drawings of cats created by convention attendees. What may have started off as a way of drawing attention to the StuffByBez stand and her latest game, Kitty Cataclysm, has now, after a year of conventions, become a focal point in and of itself, a spreading monument of communal creation. It’s easy to think that a tabletop convention in Northern England will be primarily attended by certain demographics. But there was much more diversity than I had expected. Women made up a significant proportion of attendees, families were welcomed and the ages of those walking about seemed to vary between around 7 and 70 (there were also a surprising number of pushchairs). The Family Zone (run by Imagination Gaming) and giant versions of Tsuro and Hey, That’s My Fish! (brought by the Herefordshire Board Gamers) seemed to be busy all day. At one point we were sat playing a game with a baby in the group next to us and a kid of around 10 looking over our shoulders. It felt inclusive and friendly in a way that showed my expectations to be utterly wrong. 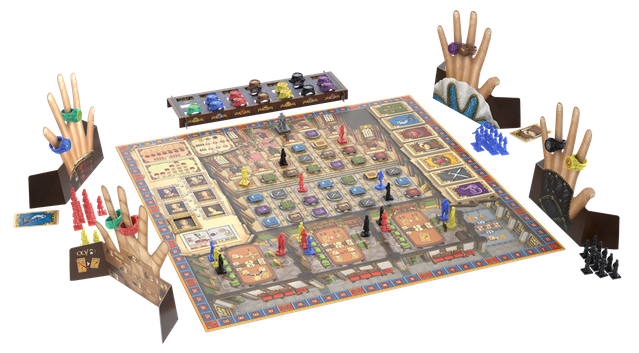 Tudor from Academy Games, image courtesy of the Tudor Kickstarter campaign. So much to do, so little time. There were so many gorgeous games being played around the convention that this section could easily take over the whole article. Older titles like Dominant Species and Agricola were spotted in the wild, the newly hatched Wingspan was much coveted, the canine miniatures of A Dog’s Life brought a smile and I resisted the urge to run up and high five the player screens of Tudor. Yet the game I left the convention most disappointed not to have tried may well have been Richard Denning’s The Great Fire of London 1666. Richard himself had lured us to the Medusa Games stand with the gorgeous Magnificent Flying Machines but we were subsequently drawn to his 2010 game. Whether it was the historical context, the use of hidden player identities, the ability to influence the fire’s spread or the satisfaction of putting little cones on other little cones, The Great Fire of London certainly ignited our curiosity. Matt Coward from the University of York gave an interesting seminar on his PhD subject – UK Tabletop Gaming Communities. Matt talked the audience through the background and initial stages of his research investigating how gaming communities form and their impact on the hobby itself and the surrounding culture. Matt’s research methods sound like the perfect job – visiting tabletop game shops, clubs, conventions and other gaming events and conducting formal and informal interviews with attendees to find out about their interests, reasons for playing tabletop games and their perceptions of the hobby scene. I’m looking forward to hearing what he finds out but I must admit that I don’t envy him the task of sifting through all the information he’s collected! Playtesting X Arrr, image courtesy of Coffee and Cardboard’s Facebook page. Conventions are a place for games at all stages of development, from the already published to initial designs. 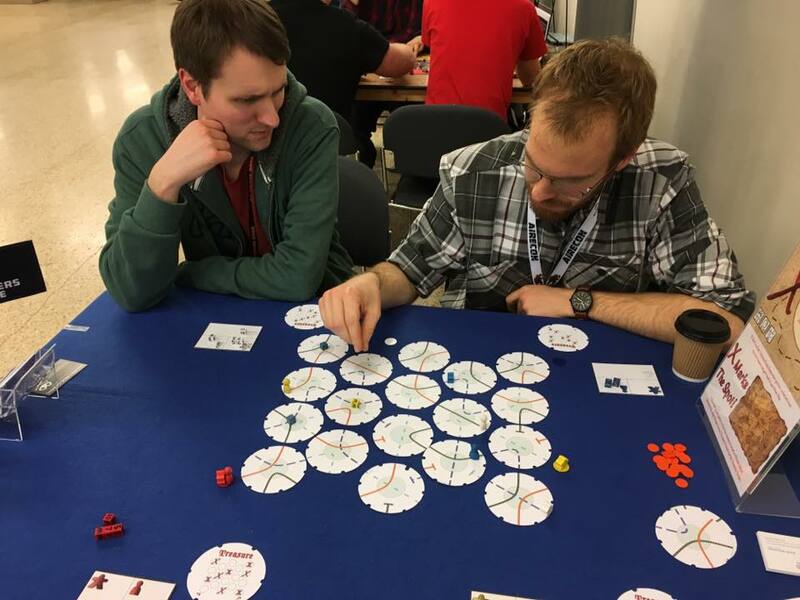 X Arrr, from Cardboard and Coffee, was the game in the earliest stage of development that we played at AireCon 5, with the designer Keith McLeman walking us through the game and making feverish notes on how we were getting on. X Arrr is a pirate themed, hunt the treasure, path-following game, a little like a cross between Tsuro and Labyrinth but a small step up in complexity from both of them. The game itself was fun but most enjoyable was seeing the rules being tweaked as we repeatedly (and unintentionally) broke them. Keith has since said on his Facebook page that the game changed throughout the day to make it leaner and shorter, and it’s nice to think we helped with that in some way. 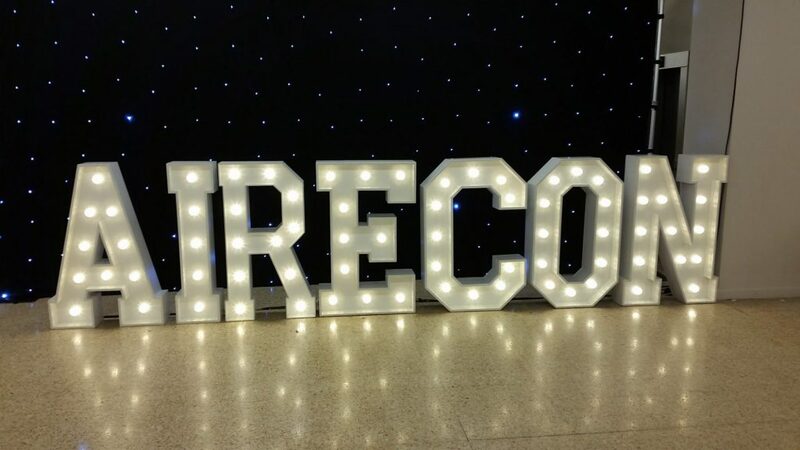 Our day at AireCon 5 was a lot of fun – games, events, cats and more games. Everyone was friendly and welcoming and, despite the bustle, the atmosphere was one of inclusion and people having a good time. My friend and I both agreed that in future we would make better use of the flags, balloons and convention app to find games looking for players – but as the phrase ‘in the future’ suggests, it’s definitely a convention we’d go to again.